Share the post "#InterLegends – Diego Milito: The Symbol Of Inter’s Treble Winning Side"
What can one say about Diego Alberto Milito that does the player justice? He came to Inter from Zaragoza and Genoa as a universally recognized “good player” and left as a club and Serie A legend. He seamlessly replaced one of the greatest strikers in the history of the sport, Zlatan Ibrahimovic, who left Inter following the 2008-09 season. The events that occurred over the following twelve months left even the most optimistic Nerazzurri supporters in a state of euphoric shock. To this day, it is my belief that most supporters of Inter, myself included, envisioned someone like Zlatan Ibrahimovic or Christian Vieri leading Inter to Champions League glory. Prior to 2010, Inter had come close to winning the prestigious competition on a few occasions since their last triumph in 1965. Instead, it was the talent of Diego Milito, under the guidance of Jose Mourinho, who would lead Inter to football immortality in 2010 by winning the treble (Serie A, Coppa Italia, Champions League). After the 2008-09 season, Inter were at a crossroads of sorts. In Mourinho’s inaugural campaign as manager of the Nerazzurri the team performed quite well, winning their fourth consecutive Scudetto and advancing past the group stage of the Champions League. For all of Inter’s domestic success, their dethroning of Juventus as the measuring stick in Serie A, and the record-setting season point totals, something was missing. That “something” was undeniably the image of the club hoisting it’s first European Cup trophy in nearly four decades. Jose Mourinho was hired to achieve precisely that. As the 2008-09 season reached it’s conclusion, Ibrahimovic was set for his departure to Barcelona. Mourinho needed a competent striker in order to secure the club’s fifth Serie A title in as many years, but moreover, to have any hope at all of challenging Europe’s big boys on the continental front. On May 20th, 2009, it was confirmed that Diego Milito, along with Genoa teammate Thiago Motta, would be transferring to Inter. Inter would send Robert Acquafresca, Leonardo Bonucci, Riccardo Meggiorini, Francesco Bolzoni, Ivan Fatic, and an additional sum of money to Genoa in exchange for the two players. This was a high stakes gamble by Inter, however, in typical Mourinho fashion, he was placing all of his chips onto the table. It was now or never for the Nerazzurri. Milito had impressed in the season prior to his arrival at Inter with 24 league goals scored at Genoa in his 31 appearances. He finished second in the Capocannoniere race to Inter’s own Zlatan Ibrahimovic by a single goal. If you are going to lose the best striker in the league via a transfer you might as well replace him with the statistically second-best. It was clear from the onset that Inter’s failures or successes would rest heavily on the feet of Diego Milito in 2009 and 2010. Despite the incredible number of goals he had tallied up until 2009, as well as playing for the Argentine national team (which we all know can be a chore in and of itself, just ask Mauro Icardi), Milito had never featured for a “big club” until he joined Inter, no disrespect to Zaragoza, Racing, or Genoa. This would only add to the pressure of the already lofty expectations many interisti had as Mourinho entered year two of his tenure with the club. Milito was a completely different type of striker than his predecessor Ibrahimovic. Zlatan was strong, physically gifted, tall, and the perfect target man in the box. Milito on the other hand, was not blessed with these physical attributes, but rather, was a skilled player who could dissect opposing defenses with either foot. His skill on the ball and eye for the goal were nearly unmatched at his position. Combine these with his superb vision and unrelenting tenacity and what you end up with is a once-in-a-generation type of player. Inter hit the ground running as the 2009-10 season officially got under way. After six match days the Nerazzurri sat atop the league table and Diego Milito had already netted five goals and assisted three more. This included a 4-0 thrashing of arch-rivals Milan only a few weeks into the new campaign. Inter would lose a mere two matches over the first half the season, a 0-1 defeat to Sampdoria and a 1-2 defeat to Juventus. Both of these came away from the San Siro. As the second half of the season got underway on match day 20, Mourinho’s Nerazzurri found themselves at 12 consecutive weeks on top of Serie A. They would again defeat Milan, this time by a score of 2-0, as well as avenge the earlier loss to Juventus with a dominant 2-0 victory, once again cementing who the rulers of Italian football were at the time. Though Roma kept the title race close, Inter were not to be outdone. They won the last four matches of the season, led by Milito’s three goals, to clinch their record-setting fifth consecutive Serie A championship. This was just two-thirds of the battle won, however. The first of three major trophies that season came eleven days prior to Inter lifting the Scudetto. On May 5th, 2010, Inter defeated Roma in the Coppa Italia final at the Stadio Olimpico in Rome thanks to a 39th minute goal from none other than Diego Milito. Despite these amazing heroics, this was not to be Milito’s finest moment during that magical 2009-10 season, not by a long shot. The Champions League had been somewhat of a struggle for Inter during the group stage of the competition. Milito missed two of the six matches and Inter were only able to muster an underwhelming nine points to finish second in their group behind Barcelona. Though they only lost once (2-0 Barcelona), draws against Rubin Kazan and Dynamo Kiev did not do much to help their cause. In the end, it only matters that you advance to the knockout stage. Inter had done precisely that. Beyond Mourinho being brought in as the manager, there were many other outstanding elements to this Inter squad. Besides fielding the most prolific attack during the 2009-10 Serie A campaign (75 goals), the Inter defense did their part as well, allowing the fewest goals in the league (34). 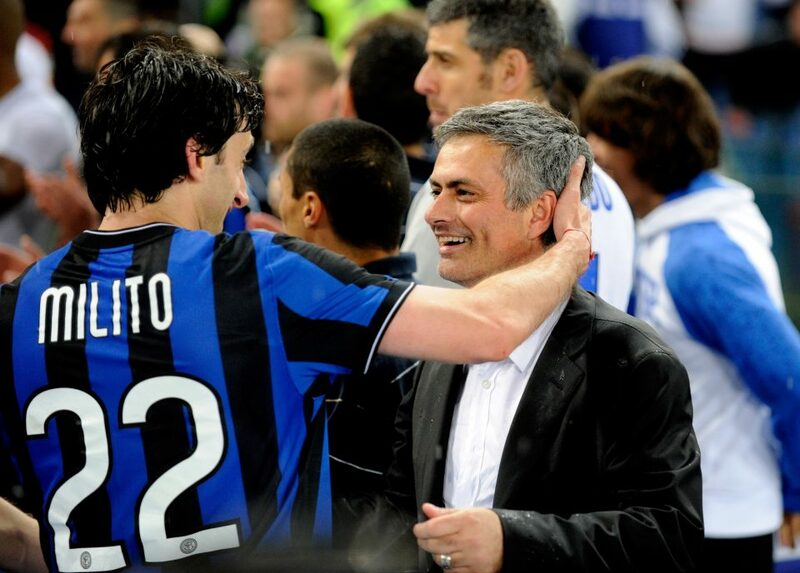 Milito fit Mourinho’s system like a glove and his individual brilliance showed it. Though, when you add the stalwart Nerazzurri defense to the equation there can only be one conclusion reached: future be damned, this team was built to win the Champions League. The good news for Inter during the knockout stage was that Milito played in every game, scoring in all four of the team’s fixtures. Though, he saved his best performances for when it mattered the most. After dismissing English powerhouse Chelsea in the Round of 16, Inter earned a hard-fought 2-0 aggregate victory over CSKA Moscow in the quarter-finals. The Nerazzurri would become reacquainted with their group stage rivals Barcelona in the semi-finals. Barcelona took four of the six possible points from Inter in the group stage, leaving many to believe that this would be where the Champions League dream would conclude for Mourinho’s squad. This could not have been a more incorrect assessment. In the first leg at the San Siro Inter defeated Barcelona soundly behind a stellar effort from Diego Milito. Milito participated in all three of Inter’s goals, scoring one and assisting the remaining two. Inter won the match 3-1. Mourinho was fully aware of the dangers of the Camp Nou. A few mistakes and you could be ripe for a five goal thrashing. Inter would not buckle, however. Mourinho’s side would not allow a Barcelona goal until the 84th minute of the match, a brilliant defensive effort from the Nerazzurri. Inter held on for the remaining six minutes and sent Messi and company home, out of the Champions League. Milito’s individual brilliance in the first leg was enough to see Inter advance to their first Champions League final since 1972. And then there was one. The only thing that stood between Inter winning the Champions League, securing a continental treble, and completing one of the greatest seasons in the history of the sport was Louis van Gaal’s Bayern Munich squad. Even with the state of affairs at Manchester United currently, one would be foolish to ever bet against Jose Mourinho in a one-match, winner-take-all situation. The true greats of the game play their best the bigger the spotlight is. On club football’s grandest stage, that is where Diego Milito would stamp his ticket to Inter immortality. He scored the opening goal of the match in the 35th minute off of an assist from Wesley Sneijder. Inter had not done much up until this point of the game. This immediately placed massive pressure on Bayern as they had to overcome a deficit against one of the best defenses the game had to offer. Bayern fought admirably and created a few good chances. In the end, however, none of them would find the back of the net. For good measure, Milito added a second goal for Inter in the 70th minute with a simple assist from Samuel Eto’o. Bayern’s spirit was crushed. Milito was subbed off in the 92nd minute, for no other reason than to enjoy a well-deserved and rousing applause. Inter won the match 2-0 behind a gritty defensive effort and an opportunistic and efficient attack. Diego Milito was named the man of the match as Inter were crowned champions of Europe for the first time in 38 years. In the process, Inter became the first and to date only club in Serie A history to win the coveted treble. Diego Milito would stay at Inter until the conclusion of the 2013-14 season. In all, he made 175 appearances for the club across all competitions, scoring 75 goals and assisting 29. Regardless of the many great players who will come after him, Diego Milito will forever be remembered as the man who shot Inter to the highest point in the club’s existence. Milito was the right player in the right system at the right time. Inter had one mission in 2010, and that was to conquer the world. Mission accomplished.